Digital technology is transforming just about everything, and fast. Yet just. 33% of organizations say their top-level managers understand and support digital initiatives. 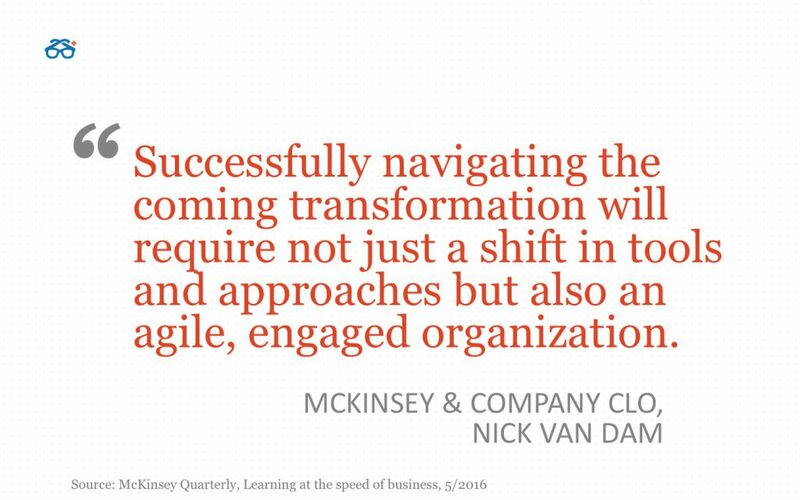 If you’re not working on transforming your L&D and HR function for the digital age, too, then maybe you should. The reality is, the world is changing constantly. And according to major startup investor Paul Graham, it creates not just threats, but also huge opportunities – if you recognize the signals in time and adapt appropriately. The threats that come with being a chief learning officer (CLO), or working for one, are real. Reality is getting more virtual. Intelligence is getting more artificial. Data is getting bigger. It will take a new breed of chief learning officer that can adequately adjust to meet the needs of today’s workforce. Say hello to the Digital CLO. Most CLOs struggle to get or stay aligned. Almost 60% of the workforce’s skill sets don’t match changes in their companies’ strategies, goals, markets or business models. Many CLOs also have a hard time being efficient. As much as 70 cents out of every dollar invested in L&D is wasted on irrelevant, redundant, low quality or unused training. Most importantly, too many CLOs aren’t actually effective where it counts. Nearly three quarters of CEOs say that a lack of critical expertise is a threat to their businesses’ growth. Some CLOs, however, are adapting and evolving – even thriving – in the face of all this digital disruption. To find out what the 3 things are that successful CLO’s do differently, join Intel and Degreed for the Digital CLO “playbook” webinar on January 31st. Register for the event here.